Drury in 2006, also letterless. 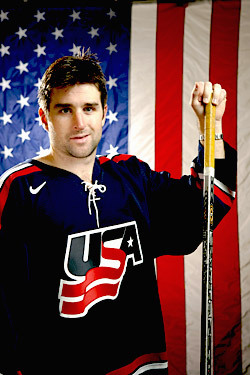 Should Chris Drury Be Offended That He’s Not an Olympic Alternate Captain? There are 23 players on the United States Olympic hockey roster, 20 of them non-goalies who are thus eligible to be named a captain or alternate captain. Yesterday, five of those twenty were given letters for their jerseys: Jaime Langenbrunner will deservedly wear the "C," while Zach Parise, Dustin Brown, Ryan Suter, and Brian Rafalski will serve as alternates. That's a quarter of the eligible players, and Chris Drury isn't one of them. To answer the question posed in the title of this post, yes, he should be offended. We won't try to defend the season Drury is having, but we tend to agree with Greg Wyshynski's reasons for why Drury should be on the team, especially the part about there being no salary cap in the Olympics. (Drury, after all, is a good player who's paid like a superstar, which won't matter in Vancouver.) But there's also little doubt that he was chosen in part for his experience, and other similar intangibles (leadership, clutch-ness, or as commenter 77BC pointed out yesterday, his league-leading poise). But it's intangibles like these that usually earn someone a letter. His experience alone — only Langenbrunner and Rafalski have been Olympians in the past — gives him a leg up on most of the team. For a short tournament like this, it's largely just an honor, particularly when it's watered down by handing out so many alternate captaincies. (How much, really, is that fourth alternate going to say in the locker room before a big game?) But considering Drury is not just one of the few veterans on the team, but one who wears the "C" on his NHL sweater, it feels like USA Hockey had to go out of their way to snub him. Brian Burke, the team's general manager, told the Times, "We know what Chris Drury can bring," and that "He doesn't need a letter." That doesn't explain much, and it kind of implies that Parise and company do need a letter, for some reason. It's almost as if it's all a subtle message to Drury: You're lucky to be on this team in the first place.